NASA administrator Jim Bridenstine says the agency will consider using commercial rockets for its lunar crew test flight. United Launch Alliance and SpaceX are the U.S. rocket builders that could win the NASA mission. But SpaceX is more likely to win the mission because of its lower costs and rapid availability. 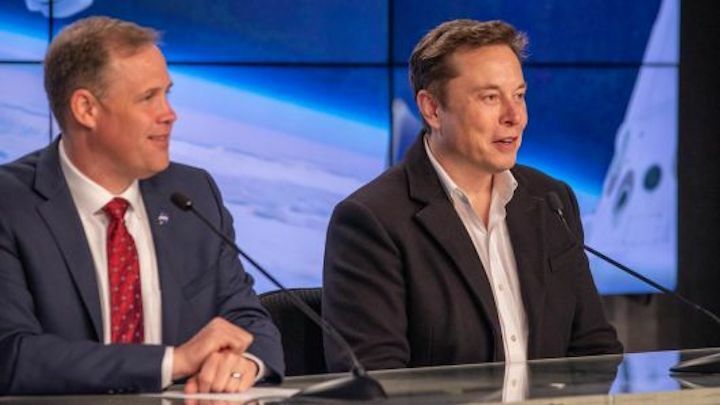 NASA administrator Jim Bridenstine, left, and SpaceX CEO Elon Musk at the Kennedy Space Center following the March 2, 2:49 a.m. EST launch of the SpaceX spacecraft mission to the International Space Station. NASA administrator Jim Bridenstine told a Senate committee on Wednesday the agency will consider using commercial rockets for its lunar crew test flight, opening the door for SpaceX to win a pair of potentially lucrative launch contracts. "I think we should launch around the moon in June of 2020, and I think it can be done. We need to consider as an agency all options to accomplish that objective," Bridenstine said. "Some of those options would include launching the Orion crew capsule and the European service module on a commercial rocket." Instead of the space agency's own SLS rocket, Bridenstine said NASA "could use two heavy-lift rockets" to send the two spacecrafts into orbit. Bridenstine also mentioned the "amazing capability that exists right now" in the U.S., and that means only two commercial possibilities: SpaceX and United Launch Alliance. ULA, the joint venture of Boeing and Lockheed Martin, launched the first test flight of the Orion program on its Delta IV Heavy rocket in December 2014. Bridenstine pointed to that mission as an example of how NASA has leveraged commercial rockets successfully. But Delta IV Heavy comes at a steep price, at more than $350 million per launch. Additionally, ULA says Delta IV rockets require two to three years from order to launch. Whether or not the mission could launch on Delta IV Heavy is a "question of whether ULA has one ready," space policy consultant Jim Muncy told CNBC. That makes SpaceX the more likely option for Bridenstine's suggestion, because of its lower costs and a high volume of launches. With SpaceX's Falcon Heavy rocket priced at $150 million per launch at most, NASA could purchase two for less than the list price of one Delta IV Heavy rocket. Bridenstine also said he wants the moon mission to launch by 2020, making SpaceX's rapid launch preparations another potentially enticing factor to NASA. For the last two years, Elon Musk's SpaceX has made the majority of U.S. rocket launches. "If speed is of the utmost importance, then they may be willing to pay more than SpaceX's stated price," Chad Anderson, CEO of investment firm Space Angels, told CNBC. "SpaceX is clearly the front-runner given this time frame"
Originally, NASA wanted to launch this lunar mission, called EM-1, on the Space Launch System. The SLS is a new rocket that NASA wants to use to send astronauts back to the moon. The rocket, which is being built primarily by Boeing, would launch Orion — the lunar capsule built by Lockheed Martin that would carry the crew. As of NASA's budget request on Monday, the administration planned to use the SLS rocket for the EM-1 mission. But the SLS program has been beset with years of delays and has billions of dollars in cost overruns. Bridenstine admitted that "SLS is struggling to meet its schedule," and he said NASA is now considering alternatives. The end goal, Bridenstine said, is "to get back on track" for the EM-2 crewed mission and to "maintain the SLS program."